He was elected under unusual circumstances. He won the primary by a narrow margin, but when some absentee ballots were counted, he actually lost by 92 votes. 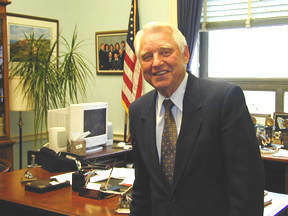 The other defeated candidates urged him to run a write-in campaign for the general election, but although he knew write-in candidates did not usually win, he sought backing from Republican Californian Congressmen, even President Ronald Reagan; but they all said it was protocol for them to support the candidate who won the primary. Packard ran a successful write-in campaign, which included providing golf pencils engraved with the exact wording needed to include him on the ballot. The day after the election the press announced that he had lost, but after all the write-in ballots were counted three days later, Packard had won by 10,000 votes. Prior to his Congressional service, he was on his local school board then served as a city councilman then mayor of Carlsbad, California. Packard was born on January 19, 1931, in Meridian, Idaho. After graduating from high school he attended Brigham Young University, Portland State University, and then earned a DMD degree at the University of Oregon Dental School. He served in the U.S. Navy Dental Corps from 1957 to 1959 before going into private practice. After he retired from public office, he worked part-time as a lobbyist in Washington, D.C. He and his wife, Jean, had seven children and now live in Utah. He is a member of The Church of Jesus Christ of Latter-day Saints. The post office in Oceanside, California, was named in his honor. A 16.6 stretch of California State Route 78 near Oceanside is designated the Ronald Packard Parkway. This page was last edited on 3 July 2018, at 12:44.